UPSSSC Answer Key 2019: VDO Answer Key 2019 is available now for UPSSSC VDO Exam 2019. The exam was organized by Uttar Pradesh Subordinate Services Selection Commission, Lucknow . UPSSSC VDO Answer Key 2019: Uttar Pradesh Subordinate Services Selection Commission, Lucknow has issued the Answer Key on 16 Mar 2019 for UPSSSC VDO Exam 2019. Answer Key can be accessed from the link given below. 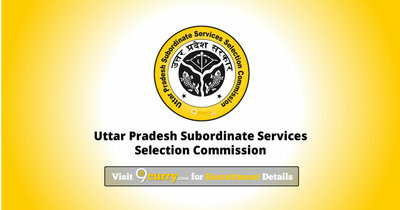 UPSSSC Stenographer Answer Key 2019: Uttar Pradesh Subordinate Services Selection Commission, Lucknow has issued the Answer Key on 10 Mar 2019 for the exam. Answer Key can be accessed from the link given below. UPSSSC Junior Assistant Answer Key 2019: Uttar Pradesh Subordinate Services Selection Commission, Lucknow has issued the Answer Key on 21 Feb 2019 for the exam. Answer Key can be accessed from the link given below. UPSSSC Tubewell Operator Revised Answer Key 2019: Uttar Pradesh Subordinate Services Selection Commission, Lucknow has issued the Answer Key on 20 Feb 2019 for Tubewell Operator Revised Exam 2019 which was conducted on 12 Jan 2019. Answer Key can be accessed from the link given below. UPSSSC Forest, Assembly Guard Revised Answer Key 2019: Uttar Pradesh Subordinate Services Selection Commission, Lucknow has issued the Answer Key on 22 Jan 2019 for Forest, Assembly Guard Revised Exam 2018. Answer Key can be accessed from the link given below. UPSSSC Tubewell Operator Re Exam Answer Key 2019: Uttar Pradesh Subordinate Services Selection Commission, Lucknow has issued the Answer Key on 12 Jan 2019 for the exam. Answer Key can be accessed from the link given below. UPSSSC Combined Gram Vikas, Panchayat & Smaj Kalyan Prayveksh Adhikari Answer Key 2018: Uttar Pradesh Subordinate Services Selection Commission, Lucknow has issued the Answer Key on 24 Dec 2018 for the exam. Answer Key can be accessed from the link given below. UPSSSC Assembly/ Forest Guard Answer Key 2018: Uttar Pradesh Subordinate Services Selection Commission, Lucknow has issued the Answer Key on 04 Dec 2018 for UPSSSC Assembly/ Forest Guard Exam 2018. Answer Key can be accessed from the link given below. UPSSSC Yuva Vikas Adhikari Final Answer Key 2018: Uttar Pradesh Subordinate Services Selection Commission, Lucknow has issued the Answer Key on 01 Dec 2018 for UPSSSC Yuva Vikas Adhikari Final Exam 2018. Answer Key can be accessed from the link given below. UPSSSC Yuva Vikas Adhikari Revised Answer Key 2018: Uttar Pradesh Subordinate Services Selection Commission, Lucknow has issued the Answer Key on 29 Oct 2018 for the exam which was conducted on 16 Sep 2018. Answer Key can be accessed from the link given below. UPSSSC Yuva Vikas Adhikari Answer Key 2018: Uttar Pradesh Subordinate Services Selection Commission, Lucknow has issued the Answer Key on 18 Sep 2018 for Yuva Vikas Adhikari Exam 2018 which was conducted on 16 Sep 2018. Answer Key can be accessed from the link given below. UPSSSC Combined Lower Subordinate (Lower -II) 2016 Revised Answer Key 2018: Uttar Pradesh Subordinate Services Selection Commission, Lucknow has issued the Answer Key on 16 Aug 2018 for the exam. Answer Key can be accessed from the link given below. UPSSSC Lower II 2016 Answer Key 2018: Uttar Pradesh Subordinate Services Selection Commission, Lucknow has issued the Answer Key on 25 Jul 2018 for Lower II Examination 2016 . Answer Key can be accessed from the link given below.